『윤순 필적 고시서축(尹淳 筆蹟 古詩書軸)』은 18세기 전반을 대표하는 명필 백하 윤순(1680~1741)이 58세 되는 1737년(영조 13) 3월에 태화산에서 쓴 것이다. 다양한 크기의 해행초로 쓰여 있는데, 소해는 왕희지풍, 중자 해서는 동기창풍, 행서와 초서는 미불 서풍을 바탕으로 동기창 서풍이 가미되어 있다. 또 윤순의 글씨 앞뒤에는 당대와 후대의 명사 네 사람의 제발(題跋)이 딸려 있으며, 윤순 서예의 장처와 한계를 지적하고 있어 조선후기 서예비평의 본격적인 예로 주목된다. 보존상태도 매우 양호하다. 윤순의 노년시절 서풍을 가장 대표하는 필적이다. Gosi seochuk (Scroll of Ancient Poems) was written in the hand of Yun Sun (1680-1741, pen-name: Baekha), an 18th-century master of calligraphy, in the eighth lunar month in 1737 (the 13th year of King Yeongjo’s reign) when he was fifty-eight years of age, in Taehwasan Mountain. The calligraphic works are in characters of various sizes, blending regular, semi-cursive and cursive scripts. His small-character regular script shows a touch of Wang Xizhi’s style, and his mid-size character seal script, meanwhile, is reminiscent of the style of Dong Qichang. Finally, his semi-cursive and cursive scripts show a mixed flavor of Mifu and Dong Qichang. At the beginning and end of calligraphic works by Yun Sun, there are postscripts written by four people, some of whom were his contemporaries. 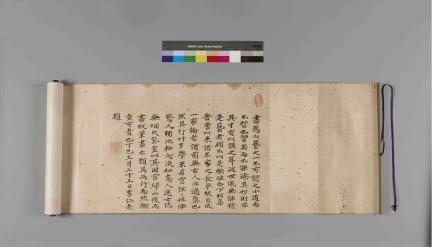 These postscripts discuss the strengths and weaknesses of Yun Sun’s calligraphy and are, therefore, examples of calligraphy criticism in late Joseon. The scroll is in an excellent state of preservation and is considered a major sample of his calligraphy from his later years.